I am pleading with you, Knitting Mojo, please, please, please come back. I don’t know where you are, or why you left. I’m sorry if I did something to offend or hurt you. Please forgive me. I just want you to come back. Soon. Please? Yes, I’ve lost my knitting mojo. It happens to most knitters from time to time. It isn’t that I haven’t been knitting at all. I’ve been working on three projects. But none of these projects makes my heart sing. Brickless is a lovely Martina Behm pattern that would be great fun to knit if only I were knitting it in a yarn that isn’t ugly and splitty and just horrible. Brickless in Tofutsies yarn is nearly finished, but I hate the yarn. Why didn’t I destash this yarn and send it to a good home where it will be loved? I guess I thought it would make a nice scarf, seeing as how it’s floppy and drapey. But I forgot about the ugly part. It looks like technicolor puke. I don’t know why I thought that knitting this yarn up might make it look prettier tolerable. Nothing can make this color way tolerable. There’s a part of me that says, Just throw the whole thing in the trash and be done with it. My version of Mary Henninger’s Syncopation Socks is pleasant enough to knit. The leg of the first sock is nearly finished. The yarn, Berroco Ultra Alpaca Fine, is yummy, the color way is fine, but it’s just, I don’t know, uninteresting? 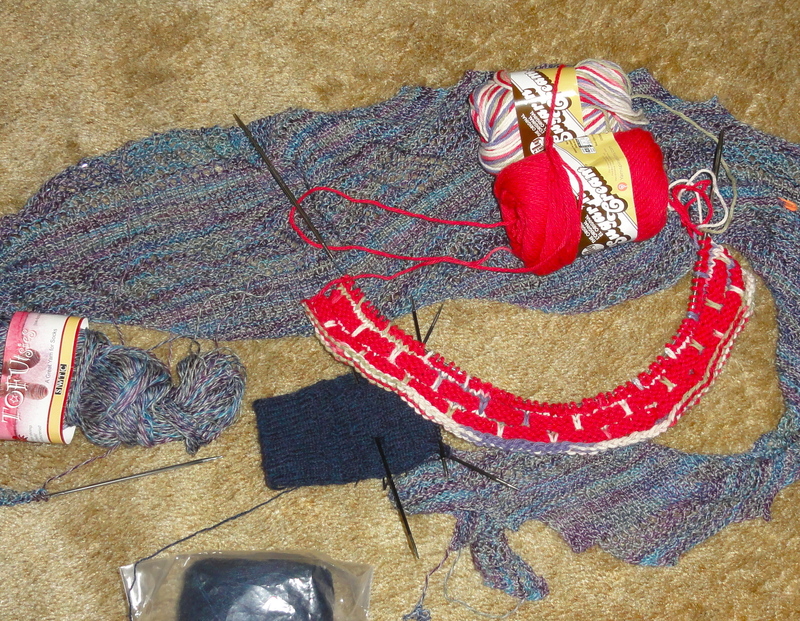 I know the finished socks will be wonderful, but I’m more of a process knitter than a project knitter. It’s the knitting I enjoy, far more than the wearing. And this project just isn’t very exciting to work on. The most enjoyable project I’m currently working on is–hold on to your hats!–a cotton Swiffer cover. You, dear reader, know that knitting with cotton isn’t my favorite thing to do. Yet I am finding this pattern for Swiffer covers to be pretty enjoyable to knit. The pattern has enough variation to keep it from getting boring, yet is simple enough that the directions are quickly memorized. I don’t have to pay much attention to my knitting, so this is a great project for playoff hockey knitting. And I bought enough Sugar’n Cream to knit a bazillion of these things, and maybe some dishcloths, too. I know I’m just marking time, waiting for my knitting mojo to return. Once she’s back, I’ll be inspired to choose a sweater or lace shawl to knit. I’ve already been stalking patterns on Ravelry, so I’m pretty sure K. M. is in the neighborhood. I expect her to ring the doorbell any moment. This entry was posted in Knitting and tagged WIP Wednesday. Bookmark the permalink. I’m surprised you feel so strongly about the scarf yarn, i think it looks quite nice! HAHAHA! Technicolor puke… What a great descriptor. Hopefully it’s not too ugly to gift. Maybe it will be better after blocking? I hope it looks better after blocking. I will wish you a swift return of your knitting mojo. Meanwhile, I love the Swiffer cover, and the colors make cleaning almost fun! I’m sure once Brickless is blocked it will look great and if it’s not your favourite colour, well you’ll still have a present for someone. I think you are probably right. And I’m sure there are a lot of people who would love the color. The yarn is a pain to knit because it’s very splitty, but it’s also very soft and silky and feels very nice against the skin. Poor you! I feel your pain. Had a little hiccup in my K.M. Myself earlier this week.